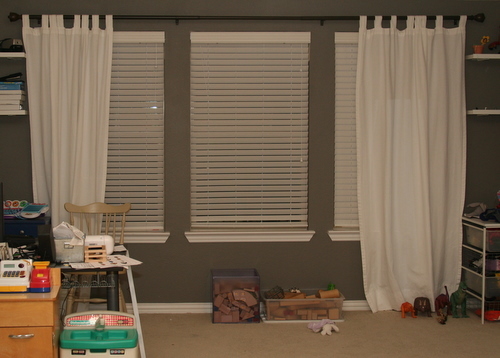 These are the windows in our office / playroom/ game room. They looked a little bare so I decided to spruce them up. 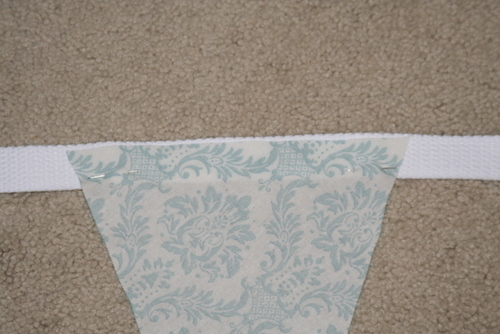 The bunting has some pops of turquoise in it which matches with other bits of turquoise in the room. 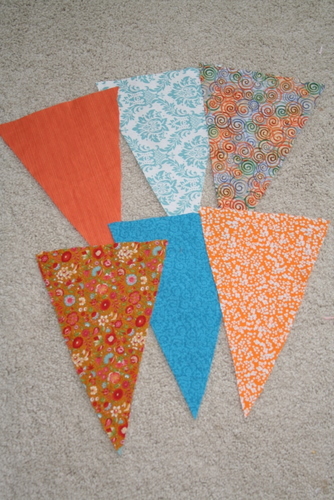 I chose to use fabrics I had in my stash and stayed in the blue and orange families. 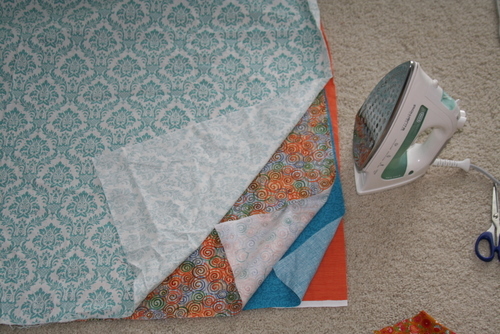 After ironing the fabric I was ready to cut out my triangles. 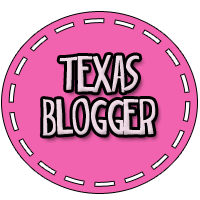 I am an impatient crafter so I wanted to make this banner as quick as possible. I initially used a piece of cardboard that I had cut into a long triangle. FAILURE – this did not work. I cannot eyeball a triangle. I kept snipping away at it, after every few triangles I cut, and finally decided I needed a new plan. 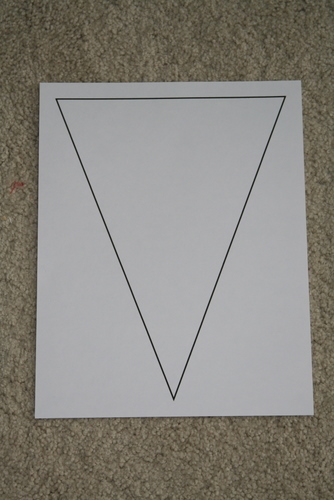 I marched upstairs to my computer, printed out this triangle on card stock, and cut it out. My new template worked great. Her’s a sampling on my fabric pieces. This picture is actually from the first few triangles which are not shaped like I wanted. Roughly every six inches I pinned triangles to a long pieces of think white trim. I then sewed two simple straight (ok, curvy) lines across the top and bottom of the trim. Simply hung it with push pins after. 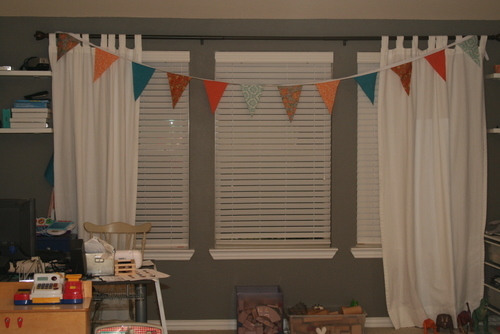 I love this so much that I’m thinking of all the places I could place pennant buntings in my house…Caroline’s room, on the stairs, a Christmas bunting, a birthday bunting, ……gotta go cut some triangles. This entry was posted in art work, bargains, budget, crafts, decorations, sewing. Bookmark the permalink. 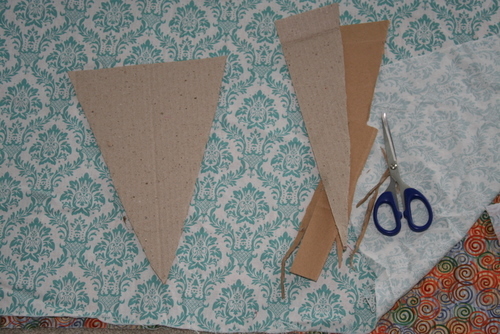 Christmas bunting, yes! It would be so cute! Yours turned out so great, I may have to make one myself. Oh, and I forgot to say yours was super cute! I love the turquoise and orange! Be careful. 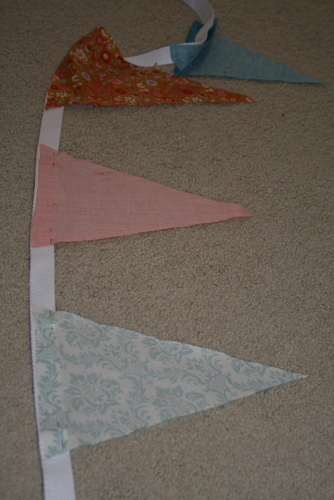 Pennants are addictive and before you know it your whole house will be covered in them. They’re so cute and frugal, though! !